This is the LOW capacity line (from 0,5 to 2 kg of size) to fill and close preformed paper bags for granular and powder products. The closure can be executed in different ways (hot melt, hot sealing, labelling or seaming). At the end of the line the bags are folded, pressed and closed with the printing of data and production lot. We can also supply lines complete with: weight control systems, automatic bundling machine with heat-shrinking ovens, transport and palletization for single bags or sachets. Here is the technological innovation in the field of packaging for dusty products and granular of the modern times. The automatic New Project packaging machines, are designed to meet Your production end investment needswith preformed paper bags with square bottom from 0,5 kgs. to 2,5 Kgs. - Simple to use, of strong construction and reliable. - Operation with cams without aid of vacuum pumps and suckers. - Withdrawal of the empty bags from the store with special system of aspiration using high potential air turbines. - Innovative electronic dosing systems by auger feeder or telescopic cups. - Extraction screw system and withdrawal of below product to the filling phase to grant an accurate cleaning of the line. - Mechanical step by step bags advancement. - Single or double scrapper for the restoration of paper bags. - Trimming of the excess paper with conveying channel and collecting system. - Paper bag folding and glueing by means of hot glue and mechanic glue roller. Upon request the line can be equipped with heath sealing, sewing or hot air systems. FOR SINGLE BAGS OR SACHETS. Here is the technological innovation in the field of packaging for dusty products and granular of the modern times. The automatic New Project packaging machines, are designed to meet Your production end investment needswith preformed paper bags with square bottom from 1 kgs. to 5 Kgs. - Simple to use, of strong construction and reliable. Here is the technological innovation in the field of packaging for dusty products and granular of the modern times. The automatic New Project packaging machines, are designed to meet Your production end investment needswith preformed paper bags with square bottom from 0,5 kgs. to 2,5 Kgs. - Simple to use, of strong construction and reliable. - Bath oil lubrification of principal mechanisms. - Double scrapper for the restoration of paper bags. - System of pressing and application of the production date and lot number. - AUTOMATIC BUNDLING MACHINE WITH HEAT-SHRINKING OVENS. Here is the technological innovation in the field of packaging for dusty products and granular of the modern times. The automatic New Project packaging machines, are designed to meet Your production end investment needswith preformed paper bags with square bottom from 1 kg. - TRANSPORT AND PALLETIZATION FOR SINGLE BAGS OR SACHETS. Here is the technological innovation in the field of packaging for dusty products and granular of the modern times. The automatic New Project packaging machines, are designed to meet Your production end investment needswith preformed paper bags with square bottom from 5 kgs. to 12,50 Kgs. - Simple to use, of strong construction and reliable. MTB produces packaging for many types of goods (powders, grains, solids) in pre manufactured paper, plastic, polypro bags or FFS-Tubes. · des matériaux pour la construction : sables, graviers, enduits, ciments, mortiers, colles... de la parachimie : lessives, détergents, produits d'entretien .. Located in Packaging Valley ITALY near to Bologna , DAKYPACK supply new and rebuilt turn-key complete lines for the processing and packaging of pressed and paste stock cubes (hard and soft cubes) focused on world market. Years of experience in after-sale service, rebuilding, spare parts, have generated new projects for food markets with skills in low-medium speed lines starting from presses up to end of line (E.O.L.) tools. To complete the offer we added from a parent company, machines and lines for stock powder or granular soup (F.F.S. FORM FILL & SEAL for sachet or stick style from reel of flexible barrier or F.S. FILL&SEAL for tins/cans/jars). Also machines built by other manufacturers (brands Fette, Benhil, Sapal.....) and generic packaging machines are reconditioned (track record on demand). We respond to the packaging equipment needs of manufacturers and deliver integrated solutions for the FMCG industries. Located in Packaging Valley ITALY near to Bologna , DAKYPACK supply new and over-hauled (retrofitted) turn-key complete lines for the processing and packaging of fresh yeast in blocks , focused on world market. Years of experience in after-sale service, rebuilding, spare parts, have generated new projects for food markets with skills in low-medium speed lines for yeast starting from extruders, cutters, ... up to end of line (E.O.L.) tools. To complete the offer we added from a parent company, machines and lines for powder dry yeast under vacuum (F.F.S. FORM FILL & SEAL from reel with HIGH VACUUM UNIT for small doses). Also machines built by other manufacturers (brands Sapal.....) and generic packaging machines are reconditioned (track record on demand). We respond to the packaging equipment needs of manufacturers and deliver integrated solutions for the FMCG industries. Located in Packaging Valley ITALY near to Bologna , DAKYPACK supply new and over-hauled (retrofitted) turn-key complete lines for the packaging (forming, wrapping, and cartoning machine, wrapping style portfolio) of small portion butter (hotel size), focused on world markets. Years of experience in after-sale service, rebuilding, spare parts, have generated new projects for food markets with skills in low-medium speed packaging lines. To complete the offer we added from a parent company, machines and lines for margarine, cheese, fats oil and other similar food products, medium and big size (Dosing, molding, and wrapping machines for butter, margarine, and pasty food fats, Filling and packing machines for spreadable cheeses, plants and linest to fill tins, drums and containers with fatty foods. E.O.L. End of line). Also machines built by other manufacturers (brands Benhil,.....) and generic packaging machines are reconditioned (track record on demand). We respond to the packaging equipment needs of manufacturers and deliver integrated solutions for the FMCG industries. Located in Packaging Valley ITALY near to Bologna , DAKYPACK supply over-hauled (retrofitted) turn-key complete lines for the packaging of small portions of processed cheese in sealed alufoil wrap,shape rectangular, triangular or round , on world market. Years of experience in after-sale service, rebuilding, spare parts, have generated capability to satisfy market with custom projects ALL-IN –ONE for packaging lines AS NEW. To complete the offer we added from a parent company, machines and lines for E.O.L. End of line (as cartoners, sealbanding machines, casepackers ...). Also machines built by other manufacturers (brands Kustner, .....) and generic packaging machines are reconditioned (track record on demand). We respond to the packaging equipment needs of manufacturers and deliver integrated solutions for the FMCG industries. In brief our target is to create a one-stop source, develop, design, manufacture and install, integrated packaging solutions (stand alone machines or lines) that are fit-for-purpose, reliable and with the right price/quality ratio. The machines are manufactured by employing stainless-steel materials and their main movements are driven ensuring high flexibility, quick change-over operations and easy maintenance. Our Company is focused on supplying a wide range of high-quality, fully refurbished, cost-effective packaging solutions for processed cheese . The Company is able to re-engineer all types of equipment in its market range to the highest standards to meet the exacting demands of modern legislation and to improve performance and efficiency, to obtain a cost-effective equipment. · Semi-automatic machine TRAY 60 with pre-glued tray fro cubes and cartons. · Size change: like the project for Nestle France in a line composed by Perfecta and BN-L.
Unilever: Egypt, Morocco, Turkey, Italy, Portugal, Greece, South Africa, Nigeria, Mauritania. Nestlè: Turkey, Germany, France, South America, Senegal, Mali, Indonesia, Nigeria, Guinea, Cameroun. All our activities are carried out on the basis of a high level of standardization in this field, and full warranties are offered to DAKY to our customers. During the last years DAKY followed the developing of the high production line for yeast between 25 and 62 grs capacity for the small 240 pieces at minute, PARMA site. .
· The first BN-L Italy size 25 grs capacity 240 cubes at minute, December 2007. · The second NB-L Spain size 25 grs capacity 240 cubes at minute, May 2009. · The third BN-P Italy size 25 grs capacity 120 cubes at minute, March 2009. · The fourth BN-L Italy size 25 grs capacity 240 cubes at minute, September 2009. · The fifth BN-P Argentina size 33-26 grs capacity 120 cubes at minute, November 2009. · The sixth BN-P USA size 62 grs capacity 120 cubes at minute, Jenuary 2011. · The seventh BN-L Italy size 25 grs capacity 240 cubes at minute, February 2012. · The eight BN-P Turkey size 55 grs capacity 120 cubes at minute, in progress. · NEW WRAPPING for yeast line for 25 to 60 grs. · NEW EXTRUDER AND CUTTER for yeast from 25 grs to 500 grs in co-operation with experienced company in Parma ITALY. · Overhauled machinery as Sapal for yeast 25 to 60 grs. · Overhauled machinery as Acma for yeast big dimension. · Machine modification, as we have done in the first 25 gr with Sapal BN-L.
· Other when request will be evaluated. Concerning 40 grs request we want to focus on are: wrapping machine, product and capacity. · Wrapping machine: DAKY propose NEW machines or second hand SWISS machine as SAPAL. · Product: We saw, in all the seven lines delivery to Lesaffre, some pieces of yeast drops down from the belt when is accumulated (near the pusher to the elevator). The friction between the products, when you push onto the elevator, breaks the edge. With brushless motor we keep them separate all the times, so when we push onto the elevator we dont have any friction. With this system we eliminate the damage on the cubes generated from the accumulation on the belt. · Capacity: Actually the big size are made with the Sapal BN-P single head at capacity 100/120 pieces minute. In case of request we are making the same machines of the small size but double head and not single, in order to reach higher production capacity: 240 pieces in a minute. The company BMA srl was founded from a project that brought together already existing businesses and counts on the Know-how obtained during the two decades of experience at the service of leading companies in the food sector and the chemical industry. This flexibility, gained through continuously coming up against customers issues, enables BMA srl to be present from the design developed at their own technical studio to the construction of sophisticated lines, to the inspection of existing plants and/or consultancy. The aim of BMA srl is to build machines and complete packaging lines for rigid and flexible containers. Thus, as a benchmark in the packaging field, we propose the most diverse powder, granular, liquid and dense products, both for food such as chocolate, cream, honey, jams, vegetable oil, sauces, pate, salt, sugar, flour, powdered milk, as well as chemical products such as lubricating oils, herbicides, glues, resins, additives, powder detergents... in several types of containers: bags, cardboard boxes and tinplates, glass and plastic bottles and jars, drums and tanks, with a capacity from 20 gr. to 1,000 kg. Our filling, capping and handling lines for the various types of containers of any material, capacity and shape, designed by taking full advantage of the latest technology combined with the measures that only experience teaches, are extremely adaptable to the specific needs of each customer. A&D AGUIRRE & DANESI Tecnologías es una empresa Mexicana especializada en soluciones de automatización, control eléctrico y equipos de pesaje. Atendiendo principalmente al noroeste del país. Verpackungs- und Abfüllmaschinen für vorgeformte Papiertaschen mit 0,5 kg bis 5 kg Pulvererzeugnissen oder Granulaten wie Mehl oder Zucker. Упаковочное оборудование для муки, риса, сахара в готовые пакеты из крафт-бумаги. Название New Project SRL Нью Проджект С.Р.Л. Обладнання для пакування борошна, рису, цукру у готові пакети з крафт-паперу. Фірма «NEW PROJECT» світовий лідер у cфері виробництва пакувального обладнання дляфасування сипких речовин (борошно, манка, цукор, крупи, сіль, кава, какао, макаронні вироби, горіхи, бобові, сухе молоко, корм для тварин, цемент, будівельні суміші та ін.) у готові паперові пакети зі складаним прямокутним дном, вагою 0,5‑1‑2‑3‑5‑10 кг. square bottom bags, dose range from 0,5 to 12,5Kgs. ink-jet coder, Metal Detector, labeller and so on. Automatic packing lines for SOS block-bottom bags for “brick packs” from 0.5 KGS. to 10 KGS. Collators, balers and shrink tunnels. Palletizes and stretch wrappers from other source (parent company) to complete lines. animal food, cement, mixes, .......) in readymade SOS paper bags (volume: 0.5‑1‑2‑3‑5‑10 kg.). ranging from 10 to 50 kg.) from parents companies. DOSING, PACKAGING (HOT-GLUE SEALING), WEIGHT CONTROL, FOR PRE-FABRICATED BAGS FROM 1 TO 10 KGS. ДОЗИРОВКА, ФАСОВКА (ЗАКЛЕИВАНИЕ НА ГОРЯЧИЙ КЛЕЙ) И ТЕРМОУСАДКА ДЛЯ ГОТОВЫХ БУМАЖНЫХ ПАКЕТОВ ВЕСОМ ОТ 1 ДО 10 КГ. in order to supply technology, machinery and related finance solution. Gsm : +386 / (0)41 953 055Podjetje BTA d.o.o. je družinsko podjetje, ki se ukvarja z dejavnostjo zastopanja, prodaje in distribucije pakirnih strojev ter pakirnih embalaž poznanih italijanskih proizvajalcev. Čeprav je podjetje BTA še mlado, je s svojo aktivnostjo prisotno pri znanih slovenskih, hrvaških, srbskih, bosanskih makedonskih in črnogorskih proizvodnih partnerjih tako z embalažo kot s strojno tehnologijo. Podjetje NEW PROJECT S.r.l. se nahaja v pokrajini EMILIA ROMAGNA v kraju Santarcangelo di Romagna - Rimini. Izdeluje avtomatske pakirne stroje za pakiranje sipkega blaga v papirnate vrečke do 5.000 g. Velike izkušnje imajo v proizvodnji avtomatskih pakirnih linij za pakiranje živil (moke, sladkorja), pa tudi za pakiranje neživil kot so mavec, zidne barve, lepila, ipd. Flour for industry and professionals, sizes from 10 to 50 kg. . This sector is experiencing a revolution by abandoning the ordinary valve bags respect to "hermetic" open mouth bags. * Maszyny pakujące: pionowe oraz poziome wraz z systemami naważania i dozowaniaWe are one of the leading companies in Polish market offering professional service and technical support connected with sales, implementing of machines, training of employees, warranty service and post-warranty service. Dzięki naszym wyspecjalizowanym inżynierom jesteśmy w stanie zapewnić szybką oraz fachową pomoc techniczną. Oprócz tego dostarczamy części zamienne do wszystkich maszyn firm współpracujących z nami. W naszej ofercie posiadamy automatyczne maszyny do wypełniania granulowanym lub proszkowanym produktem papierowych toreb (od 0,5 kg od 5 kg) włoskiej firmy New Project ITALIA. Firma New Project ITALIA po międzynarodowym sukcesie swoich standardowych maszyn P 42 i P 82 służących do średniej i wysokiej prędkości produkcji, stale rozwija resztę swoich maszyn. Oprócz szybkich linii New Project rozwija również maszyny do wolniejszej produkcji takie jak model P 25 zorientowany na torebki 1-2 kg, specjalnie zaprojektowany dla małych młynów. Systemy dozujące są realizowane w najnowocześniejszej technologii z najnowszym sterowaniem elektronicznym. System podnoszący torby z magazynu pustych toreb i formujący opakowania jest oparty na prostej powietrznej turbinie ssącej. Ruch wypełnionych toreb jest osiągany przez wibrujący kanał. Zamykanie toreb może być osiągnięte przez różne systemy (w zależności od preferencji klientów): sklejanie na gorąco lub termo zgrzew. Razem z maszyną do wypełniania toreb produktem i zamykania ich, firma New Project może również zaoferować system do zamykania w obkurczu oraz system paletyzujący. Aby zobaczyć dowiedzieć sie więcej o firmie New Project zapraszamy do ich strony internetowej. Zapraszamy również do bezpośredniego kontaktu z naszą firmą, która udzieli Państwu wszelkich informacji na temat naszych produktów oraz przygotuje ofertę indywidualną specjalnie dla Państwa. LEMATEC provides one stop services for new Project Development, Project Management, and Systems Engineering as Part of Its Strategy of providing Total Packaging Solutions. Its staff can assist customers in the successful execution of their projects. Its staff will assist in data analysis and task preparation for your project, technical advice concerning packaging, technical-commercial solution proposal, layout engineering: green field or inpecting existing site. Supplying/procuring the right equipment, providing installation, commissioning and training services to your staff. LEMATEC can provide competent, qualified service technicians to assist you in solving any problems you may encounter with your packaging systems and packaging equipment. Its service engineers are at your disposal to assist you in organizing your maintenance activities and to provide you with the best original Spare Parts for your plant in the quickest time possible. LEMATEC take care to supply original equipment manufacturer spare parts and consumables. It can be provided as regular service or an emergency service with high tracking control. Help desk - if necessary LEMATEC specialists will assist you in solving any technical issue, in order to reduce to a minimum any machine stop. This service can be also provided conecting online (if a connection is available), to deeply analize the problems you are facing. Linha empacotamento automàtica para sacos de papel Kraft, pacotes de 0,5, 1,2,5 KG., sistemas completos , enfardadeira automatica. Empacotadeiras podem ter 1 dosador-2 dosadores, de rosca ou de caneca dependendo do produto a ser empacotado e de densidade do produto. As produções das empacotadeiras colocamos o produto farinha, densidade 0,60 gr. - 0,55 gr. / cm3, produtos como açúcar sal a produção poderá modificar. Empresa especializada em embalagens horizontais a partir de ...embalagens pré formadas, para produtos secos em geral, é especializada e reconhecida, na produção de máquinas a partir de embalagens pré formadas, máquinas (máquina de envase automática) e linhas, envasadoras e embaladoras de produtos seco (a completa linha de embalagem da alimentação do produto até a paletização), material usado na embalagem papel, é capaz de trabalhar com produtos que variam de 0.5kg a 5kg, a sua saída pode chegar a até 80 sacos por minuto. As aplicações mais conhecidas destinamse a pós e grãos (farinha, açúcar e produtos similares). Dear Sirs, our Company will participate at international trade fair in DUSSELDORF Germany INTERPACK 2017 www.interpack.com , from 4th up to the 10th May, 2017 . 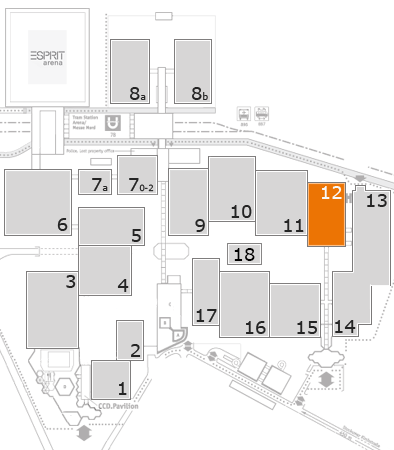 You could meet both sales force and technicians on booth B42 Hall 12 and be our guests. Our best regards. Remember that our partners and parents Companies will be present on booth. Nous sommes heureux de vous informer que nous serons à INTERPACK 2017 www.interpack.com, qui aura lieu le 4-10 Mai, 2017 à DUSSELDORF GERMANY. A cette occasion nous aurons le plaisir de vous rencontrer sur notre stand B42, situé dans le Hall 12. Nous nous réjouissons de votre aimable visite. Accueillerons à l'occasion les solutions automatiques de nos partenaires. MRS MERYEM BABADAG of ATU MAKINA t your disposal on turkish market, not sole agency. BETTI SRL Faenza RA 60 years of experience on world's markets in vertical cartoning , now producing also horizontal packaging machines : samples guest on our booth. Betti srl Faenza ra 60 anni di esperienza sui mercati mondiali in verticale astucciatrici, ora anche per la produzione di macchine confezionatrici orizzontale: ospite nel campionamento presente. Nata nel 1955 come costruttore di astucciatrici per pasta corta e riso, nel corso degli anni ha ampliato la propria offerta a tutti i prodotti sfusi granulari, in pezzi e polverosi confezionabili in astucci e barattoli con riempimento verticale. Accanto alla vasta gamma di astucciatrici, lazienda realizza sistemi per il confezionamento automatico a fine linea, prototipi e automazione dedicata. Tra i prodotti confezionabili ricordiamo prodotti alimentari sfusi o preimballati da introdurre in astuccio come pasta corta, cereali, sale, zucchero, biscotti, surgelati, cioccolatini, caramelle, farine nonché tutta la gamma di pet food. Ma anche prodotti chimici e non, come detersivi in polvere o in compresse, bicarbonato, colle, stucchi, fertilizzanti, fitofarmaci, sementi e minuteria. Fornisce inoltre soluzioni per il confezionamento bag in box e accessori di svariate tipologie. Today its customers can rely on a wide range of vertical cartoning machines, filling machines for jars and plastic cans, case-packer machines for american case, wrap-around case-packer machines, tray forming machines and shrink wrapping machine. Up to now more than 2,000 installations have been set up. All of them are overseen by a technical-commercial network operating in the largest countries in the world. The Machines have production outputs of up to 360 cartons a minute, 120 cans a minute, 32 cases a minute, depending on the different models. Multipurpose machines are manufactured using modular compositions that allow packaging different products using different systems, with just one machine featuring very quick size change. The company New Project, based in the heart of "Italian "packaging valley", Emilia Romagna region, Bologna area in particular, has developed reliable automatic packaging machines tested worldwide, starting from the forty years of technical experience of the founder in the district of Santarcangelo di Romagna Rimini join with the thirty years of expertise of the head of sales. Entry level models, medium and hi-speed lines (from 0,75 tons/hour to 6,75 tons/ hour, single or double doser), allow the customers to perform a constant productivity (24/7/365) thanks to a Made in Italy building and a direct manufacturing of components. Not a simply engineering or assembling company, but a tailor made construction, friendly-user for a long-lasting investment. New Project, a family-run business, established thirteen years ago, is based on the experience of the founder in engineering lines in the district, inside Italian packaging valley, integrated with technical and sales skills of the head of sales, resulting over 130 packaging lines of this brand installed worldwide with customer satisfaction (approximately 90% of turnover is exported throughout the world). Complete automatic lines for industrial primary packaging (bag filling & sealing) from pre-madekraft paper bags for bulk and powder products. Fill & Seal (FS) automatic primary packaging lines from pre-made bags of Kraft paper, range of weight from 0,5 Kg up to 5 /10 Kg. to pack flour (wheat flour, maize flour, semolina, mix), sugar (cane, crystal), other food and non food bulk, granular or powder commodities (tea, herbals as Yerba mate, cous cous, boulgour, roasted spices ...coal, chemicals, dry building products). Linear intermittent mechanic technology, Models P25, P42, P82, P92 with mechanical and effective speed from 25 up to 80 cpm. Standard bag closing systems and shapes. Bag shapes and size according to marketing requirements. Special projects and optional items (complete lines: collators for paper or plastic stretch film, multipack, palletizers, wrappers, EOL End of Line, automation). Complete lines and special customized projects from a single source. New Project is going to participate in the forthcoming Interpack 2017 show, Düsseldorf, Germany, May , 04th to 10th, 2017, Hall 12 - booth B42.